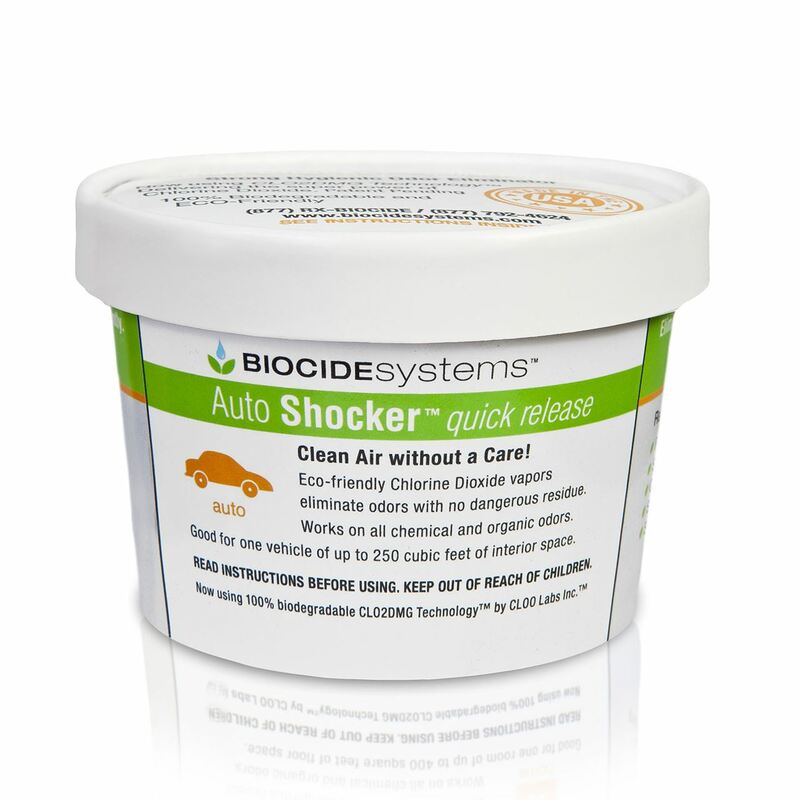 Auto Shocker ClO2 Odor Eliminator Quick Release - Biocide Systems. Our revolutionary Auto Shocker Quick Release product is a single-use high-tech packet that delivers the most effective chemical deodorizer (Chlorine Dioxide) safely to neutralize and eliminate even the worst odors in your car. Because Auto Shocker works like fumigation bomb it will effectively reach places that other products just cant get to and safely eliminate the odors. It literally seeks out the odor causing molecules like a smart bomb. The ClO2 vapors will permeate the headliner, visors, seat cushions, glove compartment, carpet, floor mats and all nooks and crannies where odors get trapped. It will even clear out your HV/AC unit from mildew musty stale odors. Auto Shocker eliminates all odors, including cigarette and cigar smoke odors, pet odor, vomit odor, sour milk odor, musty odors and more. "New Car Smell" -- Auto Shocker attacks Volatile Organic Compounds (new carpet and new plastic smells) as well. Car detailers love Auto Shocker, and we're seeing more and more rental companies use it as well. It is so simple to use and so effective you won't believe it! STEP 1: PREPARE YOUR CAR This is very important. You should clean up your car, removing all dirt, debris and other trash. The less stuff that is in your car, the more the ClO2 will attack the odors. Make sure that the gas can get to the odor -- set floor mats on their sides, put your visor at half-mast, open your console and glove compartment, etc. You must use Auto Shocker in the shade or out of sunlight. ClO2 degrades very quickly in sunlight -- one reason why it is so environmentally friendly. STEP 2: ACTIVATE THE PACKET Follow the directions on the packet and at all times keep people and pets away from exposure to the gas. It is safe when used as directed. It is not toxic, but it is an irritant. STEP 3: VENTILATE YOUR CAR After using and disposing of the packet according to the direction, you'll need to ventilate your car. Open the windows and doors and let the car air out. There will be a slight chlorine odor that will fade quickly depending on how much sunlight and heat your car is exposed to. Your car is now very odor free.